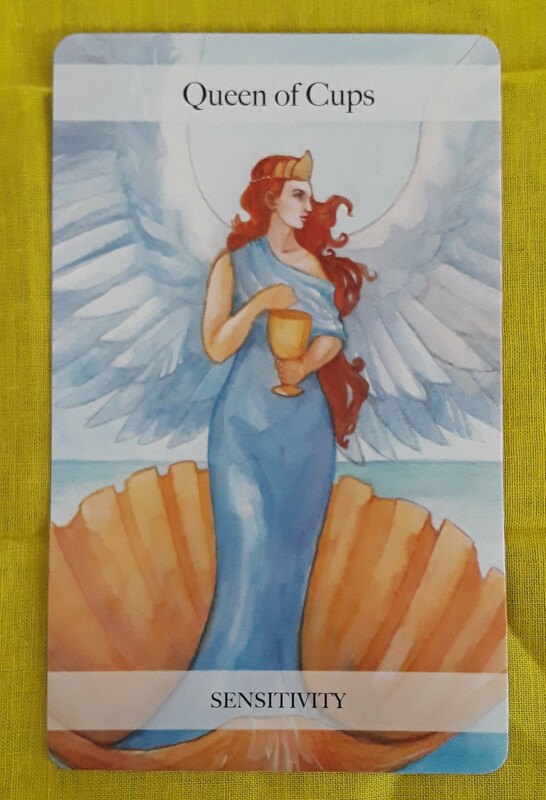 The Tarot cards for today, Saturday and Sunday are the Queen of Cups (Sensitivity) and the Seven of Wands (Challenges). Sunday into Monday is going to be a lunar eclipse, which may bring sudden change or unexpected news, if it hasn’t already. It may be easier said than done, but to the best of your ability, be gentle with yourself. Listen to your heart and mind and do what you need to do to feel emotionally secure. And while you will have your own challenges, the people around you also have their issues. Try not to get triggered by others; hold on to your emotional center. Hi, all! 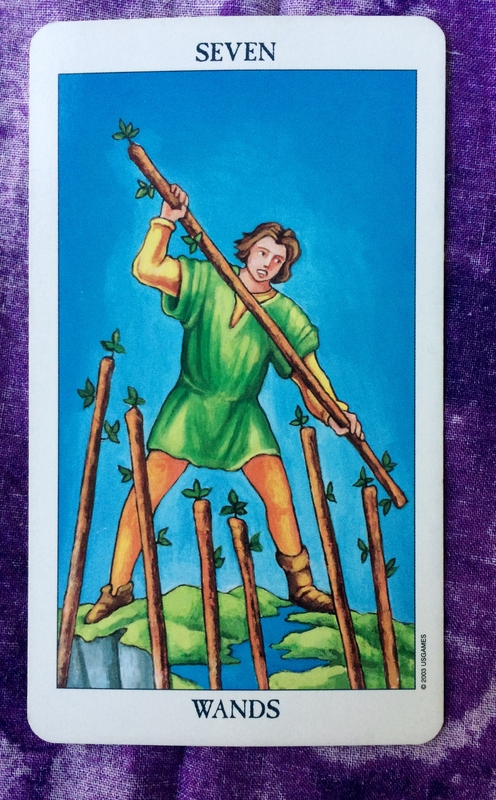 The Tarot card for today is the Seven of Wands. This is one of the cards we had for the past weekend. Conflict continues to be an issue as we start this new week. There are lots of astrological transits that may be playing a part. But I think for this Tarot reading, let’s put the focus on the new moon that will occur later on tonight. This is a time of new beginnings —so start out strong. Stand up for your beliefs even though others may not agree with you. You alone know what is right for you, so go with how you feel. 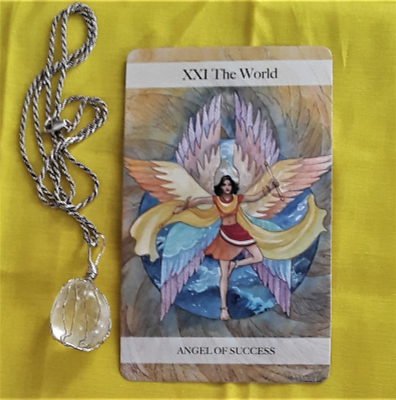 The Tarot cards for today, Saturday, and Sunday are the Five of Wands and the Seven of Wands. There is a lot of energy swirling around and it may feel like the energy is being directed at you. But in this case, how you feel inside is affecting how you see the outside world. 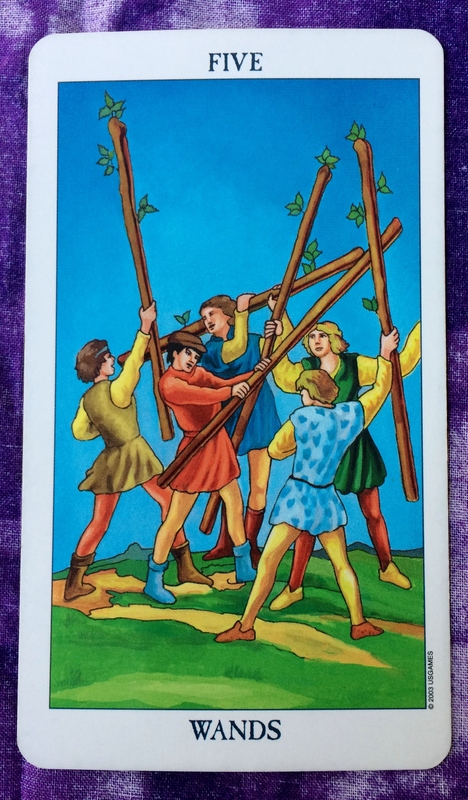 The Five of Wands suggests that no one is intentionally trying to offend you. So stay calm these next few days and take everything with a grain of salt. Hi, all! 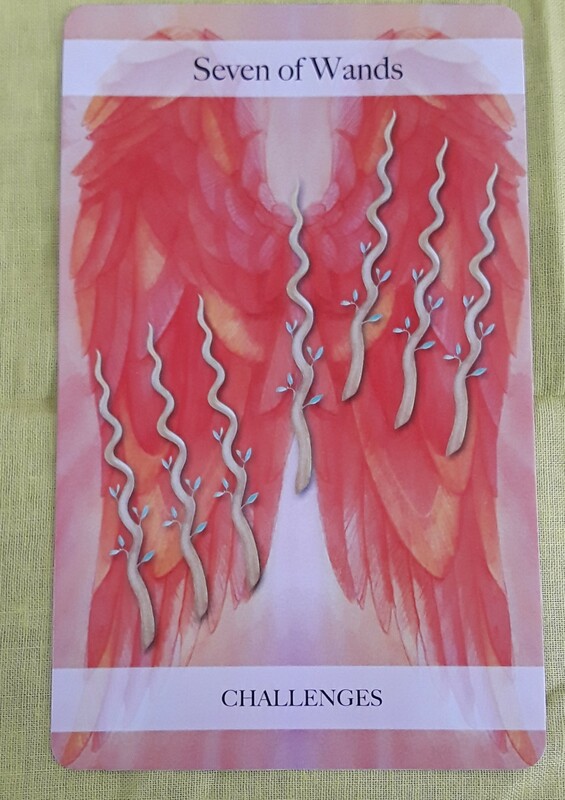 Today’s card is the Seven of Wands. 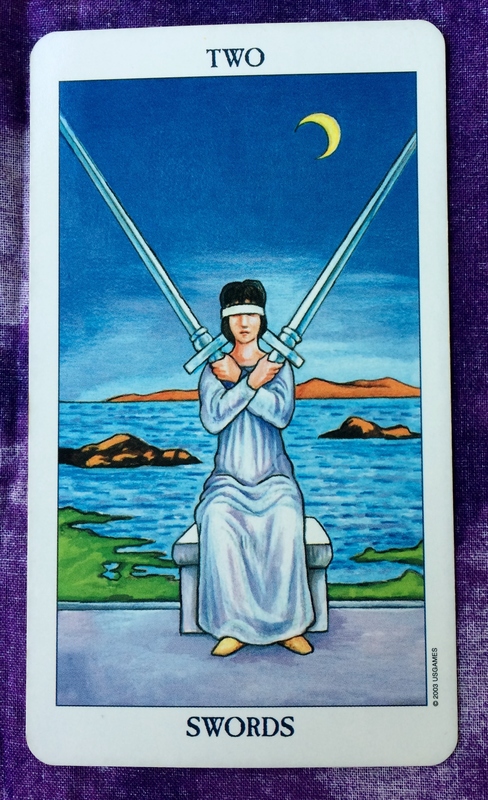 If there is a competitive situation at work, this card is an indicator that you will come out on top — as long as you don’t back down to pressure. This card could also relate to any area of your life. Stand up for what you believe in, be confident that your ideas are valuable, and trust that you are doing the right thing. The opposition will eventually have no choice but to back down. The Tarot cards for today, Saturday, and Sunday are the Fool and the Seven of Wands. After last night’s new moon/solar eclipse, new beginnings and opportunities lie ahead. 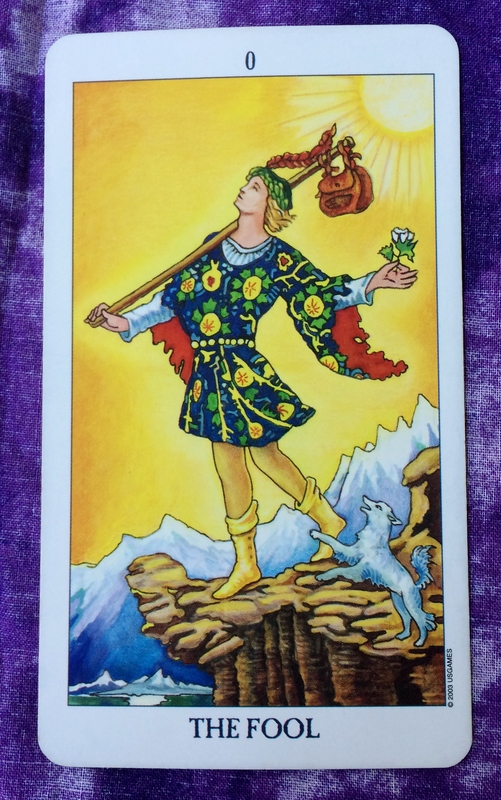 The Fool card reminds us to approach these opportunities with an open mind and open heart. Be optimistic. Change, even good change, can be scary, and sometimes it is hard to believe that the nice things that happen to us are real. 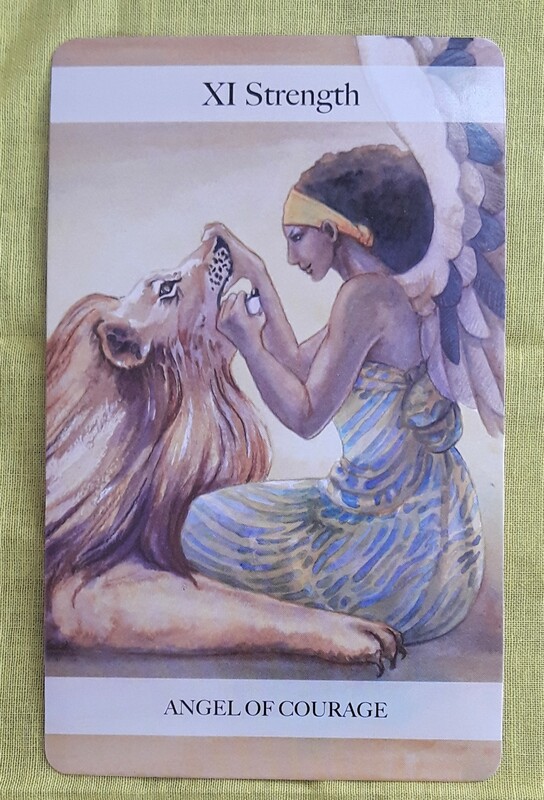 Like the character on the Seven of Wands card, fight through these feelings of fear and caution, whether these are based on real or imagined threats. When it is all said and done, you will be victorious. Enjoy the journey.